At the end of last year, I tried something out in my home that I had never tried before and since I loved the result so much I wanted to share the process with you. Yes, it's using OSB to floor my son's bedroom. When I tried to find guides or tutorials about how to source, fit and seal the boards I literally couldn't find anything online so thought it would be useful to share our process and how we did it ourselves. What is OSB I hear you ask? Well, Oriented Strand Board (OSB) is a type of engineered lumber similar to particle board, formed by adding adhesives and then compressing layers of wood strands in specific orientations. It's normally used in construction and is responsible for 70 percent of all floor, wall and roof sheathing in North America! OSB 3 which is what I've used here is a strong, versatile board suitable for structural use in humid conditions. You'd normally see it in structural flooring hidden underneath carpet etc. so it definitely has a bit of an industrial feel which I love. I think it's quite playful for a kid's room and really glad I used it even I'm not sure it would fit the aesthetic for every room in our home. When designing my son's new bedroom I was trying to find the right flooring. I wasn't sure about carpet and didn't really want to use laminate or engineered wood floor and as it was a new section of the house there were no natural floorboards. Then a friend's bedroom appeared on my Instagram feed and instantly I knew that this could work. I loved the natural look it had and the seal Charlie used gave it a natural sheen. When I saw it in the flesh at her house with a rug on it giving it warmth I knew it's how I wanted to proceed with my project. Thanks Charlie! Saw. A plunge saw would be the ideal tool for this. A circular saw is too heavy duty and may damage the boards on cutting. We used a jigsaw (and my husband's steady hands). You can see from the image below that we are putting the boards down on top of timber boards. The reason for this is only due to the fact that I had the idea to use OSB as flooring after the builders had installed the other boards! If you have suspended floors like us I'm pretty sure the OSB could go straight down on top of that. We got tongue and groove boards so they could slot together and not come apart over time and for added strength and staying-power, John put nails in the 'tongue' to attach it to the floor (see image below). This would also stop the boards from creaking which is one of my husband's pet-peeves. When using any wooden boards they will move and shift with changing temperature so getting them firmly in place is important. Stagger the position of the boards across the so the joins aren't side by side. This will also increase their staying-power! An issue we found was that sometimes the boards didn't slot together easily into the tongue and groove like they were designed to. The reason for this was that dust and bits of wood got stuck in the grooves and so we made sure that the floor underneath was swept, hoovered and kept clean throughout the process. You want the boards to slot together tightly with no gaps for aesthetic reasons but also this will minimise movement with varying temperatures (which is normal behaviour for wood). And How do I seal it? I used Osmo Polyx Oil to seal and protect the floor. It was a pretty easy process and I applied two coats using a wide hand brush. The fumes are pretty strong so you need to allow the room to ventilate with open windows for a few days after application. It's a little pricy at around £30 per tin but was well worth it. This 0.75l tin covers 18 metres squared (and my room was 9 metres squared) so a full tin was needed to achieve two coats in my relatively small room. There are other wood effect colours to choose from so you could go for something a little different but I really wanted to boards to look as natural and untreated as possible to give a more industrial look so I loved this choice. Some other things I love about this product is that it's based on renewable raw materials and as that sticker says on the front, it's suitable for children's toys so perfect I'd say for a kid's bedroom! The only drawback I can think of is that before you seal it you must be careful that the OSB doesn't come into contact with water. I'm talking from experience here! The radiator in Jack's room wasn't fitted yet and some water overflowed from the pipes onto the unsealed floor. Because of the way the strands are glued together, they expand and break apart when they come into contact with water and the wet area of the boards became bumpy rather than smooth (not the desired effect). However once they are sealed with the polyx-oil I can confirm that any water spillages (of which we have had a couple) won't damage the OSB at all and the water will just sit on top rather than soaking in. I've had a few people ask questions about the OSB floor so here are my thoughts. Do you not constantly have splinters on the floor? In a nutshell no. This high grade OSB3 is super smooth and once protected I've found that it remains smooth and I have absolutely no hesitation to walk in there with my bare feet. However I would say that I think you really need a rug of some sort on the floor so the room is less echoey and to add some cosiness so that will also help with this concern. Surprisingly yes. I don't know the exact science or density of the material but both here and in my friend's room, it's surprisingly warm to walk on the OSB floor. Maybe part of the reason is that both rooms are on the first floor so have warmer floors anyway due to rising heat. Plus we were lucky that some hot water pipes run under Jack's floor so that helps even more. I think it would look quite bare without any rug so you need some floor covering to really finish off the look. I am super pleased with the outcome of this room using OSB to floor it, especially when dressed with a rug. 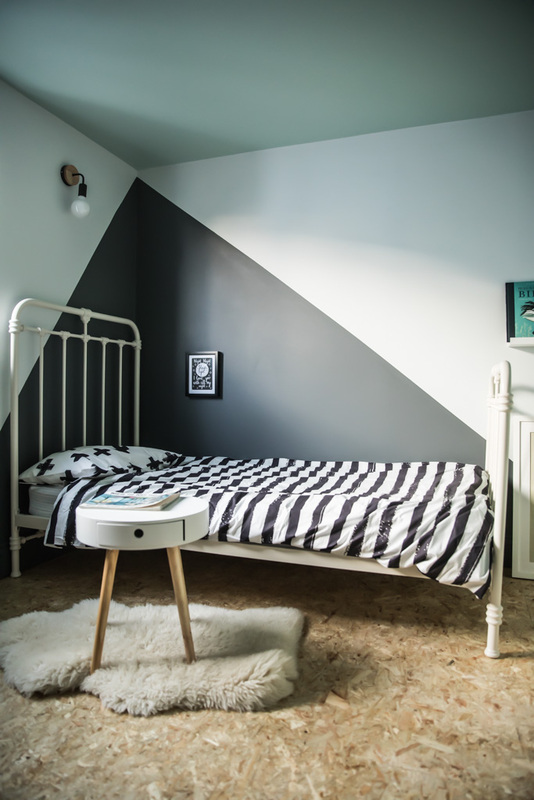 It was the cheapest option over carpet or laminate flooring (costing only £150 for the OSB boards AND the wax) and gives an edgy look which works with this kid's bedroom. And you could make a notice board or some other bits from the leftover OSB! I'm now thinking where else I can use it in my home... John found it relatively easy to install and the sealing process was also very straightforward. So if you're thinking about it, I would say go for it! Let me know how you get on on my Facebook page or tag me on Instagram. And any thoughts or experiences that I may have missed let me know! I'm fully aware that I am no DIY guru and these are not the most extensive instructions but I hope they give you a great place to start. DISCLAIMER: This is not a sponsored post. I just loved using this material to floor my son's room and wanted to share the process. All photography by me.